In the new series of Getaways, presenters Vogue Williams, Tommy Bowe, Mairéad Ronan, and Joe Lindsay jet off to some of the most exciting and diverse places reachable by plane from Ireland, promising another year's worth of travel inspiration. 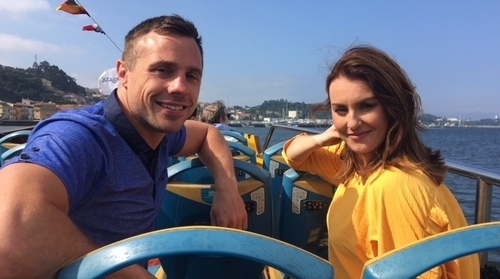 In this week's envy-inducing episode, we follow along as Tommy and Mairéad take in the sights around Porto, Portugal's second-largest city and a thriving gastronomic centre. Just a few years after Lisbon boomed with tourism, the city revitalised after the recession by an influx of eager visitors, Porto is experiencing the same fate. The hilly city is predictably an ancient port town, and as life sprung around the Douro river estuary from around 300 BC, it is one of the oldest European centres. Winding streets, grand and impressive bridges and multi-coloured facades that glimmer in the sunlight like gems give the city an irresistible air of romance, and indeed has inspired more than one writer, including our own Kevin Barry, who based the setting of his novel City of Bohane on the intriguing city. Porto also gave its name to port, the sweet and heady fortified wine, which can be found all over the city at a range of prices from incredibly cheap to incredibly expensive. Happily, the standard is almost always exceptional. On their trip, Tommy and Mairéad test drive a city break in Porto, first enjoying a cruise down the River Douro - the best way to take in the old-world majesty of Porto's impressive bridges. The pair also stop in at one of the city's entrancing bookshops, of which there are many, although the Livraria Lello, with its intricate bone-white facade concealing a wood-paneled wonderland straight out of Beauty and the Beast, complete with stained glass roof, floor-to-ceiling bookshelves and a jaw-dropping red staircase. And on this week’s Short Getaway Joe Lindsay is inspired in Heaney Country.